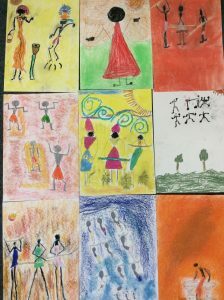 What we did: in art this week we learnt how to draw a picture called the three African men using chalk and oil pastels. It was very, very fun we’d love to do it again sometime. Brianna: I’ve learnt about an artist called Gakonga, and I have learned how to draw like him. I liked this lesson because it was very fun and I think everyone enjoyed it. Jasmine: I liked this lesson because I got to learn so much about this African artist. What we did: In literacy this week we looked at an African fable – ‘why the warthog was on his knees‘. We also looked at how play scripts are written and wrote and performed our own version of the fable. What we did: In maths we looked at different African animals and their measurements. We practised converting measurements between cm and m. We also created bar graphs and comparison bar graphs to show our favourite African animals.